Since this devastating storm hit the Gulf coast in 2005, a total of 30 church members have participated in eight trips to Mississippi and Louisiana to assist with reconstruction efforts. 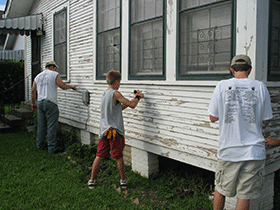 These efforts have included yard cleanup and debris removal, home clean out, roofing, sheetrock and trim installation, house painting (inside and outside), church construction, church building renovation, etc. This Nashville based organization provides a means for timely relief when domestic disasters strike. All members are given the opportunity to participate in this effort through special contributions.